Terry Bowden isn’t going to say whether or not Auburn should. “I’ve learned to be the head coach of the team I’m working for, and I try not to get involved (in the current affairs of his past teams),” Bowden says. But he is perfectly fine with saying that Auburn could. He was with the 1993 team everyday. He knows what they did in every game. He knows what they would have done in any game. In Bowden’s first year as Auburn’s head coach, the Tigers beat two Top Ten teams, including Alabama, the defending national champs (“and they went undefeated the next year during the regular season”), and wound up 11-0. It was the first time a head coach had gone undefeated in his first season at a Division I school. Auburn won everything in 1993, everything except the hearts and minds of Associated Press voters not named Beano Cook, which is to say everything except the national championship. Auburn did not win the national championship. Auburn did not win the national championship. Auburn did not win the national championship. Ask Dan Wolken, ask anyone–anyone except the National Championship Foundation (and the NCAA). 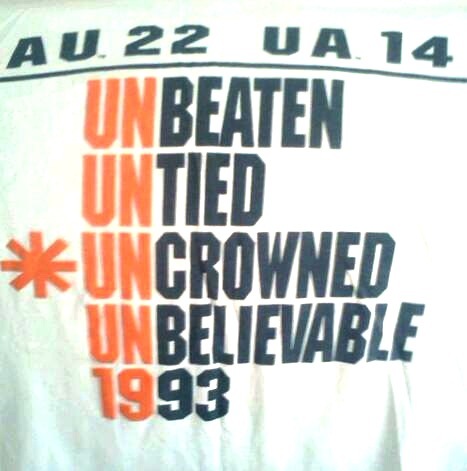 The 1993 Auburn Tigers won the National Championship Foundation national championship. Auburn’s Athletic Department has, despite the claims of recent click bait, acknowledged the NCF championship for at least the past ten years, but only in the pages of the Auburn Football Media Guide, not with banners installed at Jordan-Hare Stadium. Signage equals claiming (which is somehow different from acknowledging), and for reasons rooted deep in the Auburn psyche, claiming championships awarded to Auburn by groups like the National Championship Foundation has been out of the question since Bama Got 12. But a growing number of people, Bowden included, doesn’t necessarily think it should be. Other teams like, oh, Alabama, Bowden says. “Alabama is a perfect example.” And exact same criteria like, say, the National Championship Foundation. Yep, the NCF is the organization that gave Alabama its first national championship all the way back in 1980, though the news took a little while to get to Tuscaloosa. Up until 1984 or so, everyone at the Capstone and across the universe thought the Crimson Tide won its first national championship in 1961, four years after Auburn won its first. Nope, the NCF said, it was 1925. Alabama popped the cork and printed the shirts. If you’re going to go count him, then count Bowden in the “why shouldn’t Auburn?” camp. Time to laugh our asterisks off? Neither would Bowden. 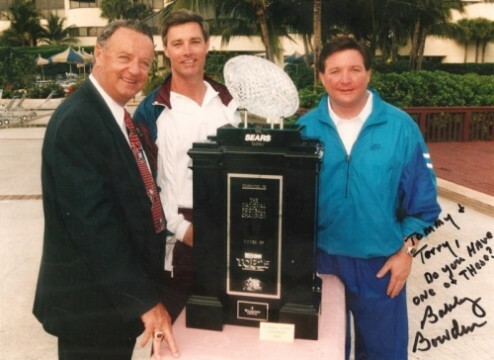 In fact, if Auburn did lay claim to the 1993 national championship with signs and shirts and pomp and circumstance, Bowden says he would love to be a part of it. He was invited to the event honoring the 1993 team on its 20th anniversary last year, but couldn’t make it. But Bowden doesn’t think his 1993 team is the only undefeated, untied, uncrowned Auburn squad whose championship-worthy accomplishments warrant at least a discussion about further recognition. Oc course, he doesn’t think the national championship debate—which he’s not sure can ever be resolved without a 16-team playoff—should be framed solely as a talent comparison. “My father’s team that won the national championship in 1993, people will say ‘well, this (Auburn) team couldn’t have beaten that (Florida State) team that year.’ Well, great years are about chemistry as much as they are about the quality of players,” Bowden says. So who wins between Bobby Bowden’s 1993 Florida State Seminoles and Terry Bowden’s 1993 Auburn Tigers? Terry Bowden answers the questions before I even finish asking it. Do you really want to go there, Dad? 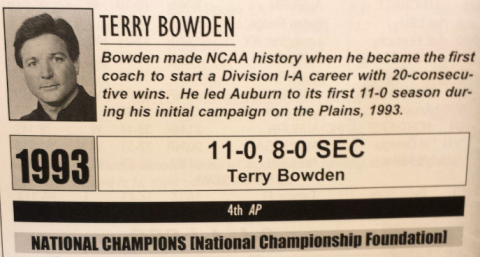 Bowden says the 1993 season was so amazing, so surreal, that the possibility of celebrating a mythical national championship outside the sanctity of the opinions of AP voters who, due to a one-year TV ban imposed on Auburn as part of the probation Bowden inherited, didn’t even see the Tigers play that year wasn’t even on his radar. “You were so thankful for so many things that happened, so many great things to be proud of, you didn’t have to get into that argument to feel good about yourself,” he says. But he does remember the icing-on-the-cake possibility that Auburn, as the only undefeated team in the country at the end of the season, could, like Auburn’s 1957 national championship team, still wind up number one, even without playing in a bowl game. “I do remember some discussion, some of the debate,” he says. “There was interest in whether the AP would vote us number one. We weren’t allowed to be voted for in the other poll, the USA Today poll I guess. There was some debate about where they would put us. Related: Pat Dye Claimed National Championship for Auburn after the 1984 Sugar Bowl, said Auburn would order rings. The National Championship Foundation did not “retroactively” award Auburn the 1993 national championship. It did so contemporaneously after the 1993 season.